Firstly, it turns out that Bambietta’s attack hit Shinji, and he collapses in a smoking heap as another explosion goes off behind him. Bambietta says that it doesn’t matter if Shinji’s Zanpakuto disoriented her, as she can just blow up everything and kill him that way. She reveals that her Sternritter letter of ‘E’ stands for ‘the Explode’, and she uses her Vollständig wings to fly up and bombard the area below her. When the smoke clears, she sees that Komamura shielded Shinji from further harm, and at that moment Momo appears and attempts to attack Bambietta. Sadly, any awesomeness that might have resulted from her rushing Bambietta is negated by Komamura grabbing her and moving her out of the way of Bambietta’s attacks. He then chastises Momo for being too rash, and says that she can’t use her Zanpakuto to offset Bambietta’s attacks. Quincies seem to do lots of overkill. 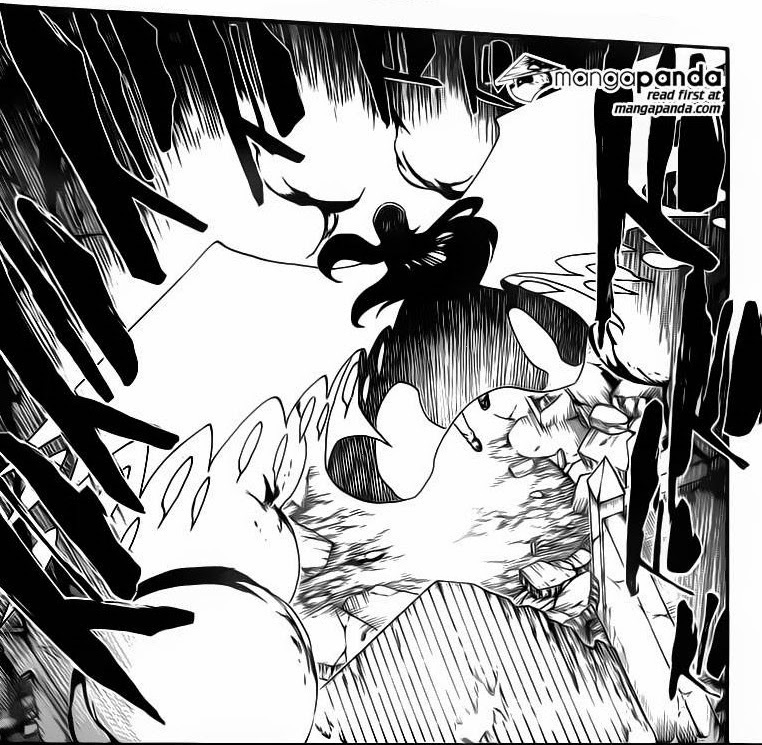 As Bambietta readies another attack, Komamura prepares himself, realising that there’s a tiny gap between the impact of the attack and the explosion, and reasons that he can repel the explosion. However, at the last second he dodges out of the way, and Bambietta notes that he’s realised the true extent of her power. It turns out that she doesn’t simply fire explosives, but that everything that’s hit with her Reishi becomes a bomb, and so her attacks can’t be blocked. As she fires yet another barrage, Komamura shields Momo and Shinji, and when the dust clears, Bambietta taunts him some more. What she doesn’t realise is that underneath his armour, Komamura is now apparently human. So yeah, that’s a thing now. Wait, didn't he lose that ear? 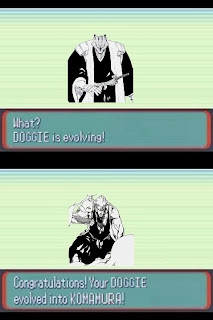 It would appear that Komamura won the fight against his great-grandfather, and so the hidden technique was passed on to him. Apparently, Komamura and his kin are werewolves, and were banished to an animal realm. At some point, they moved/escaped to the Soul Society, and discovered that they can temporarily revert to being human, and gain immense strength in the process. However, Komamura’s great-grandfather only agrees to teach him the technique if he gouges his own heart out and offers it up. 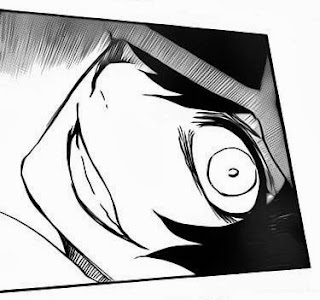 This is not the face of sanity. It's quite impressive that he said all that in one breath. Even though Shinji is more than likely still alive, I have to wonder why Momo showed up. At least Shinji’s Zanpakuto was useful in this fight (only for a moment, but still), whereas the only thing that Momo’s does is shoot fireballs, which wouldn’t be very effective against an opponent who can cause anything to explode. Unless Momo has secretly gained a Bankai (which, to be honest, wouldn’t entirely surprise me), I don’t really see how she’ll be useful in this fight. Does it have a mustache? Because that looks like one awesome mustache. So yeah, Komamura is a werewolf. Perhaps surprisingly, I never questioned why he looked the way he did. When I first saw him, I just thought ‘oh hey, that guy’s a wolf. Cool.’. I have to say, I’m on the fence regarding whether or not I like his new transformation. On one hand, it could provide grounds for some character development, and it could result in him getting some fairly-needed screentime. On the other hand, it has pretty much removed the main unique thing about Komamura, and given that it sort of came out of left field, I’m wondering how (if at all) Kubo is going to tie it into past storylines. At the moment, I’m giving Kubo the benefit of the doubt, although this may change depending on how the next few chapters go. 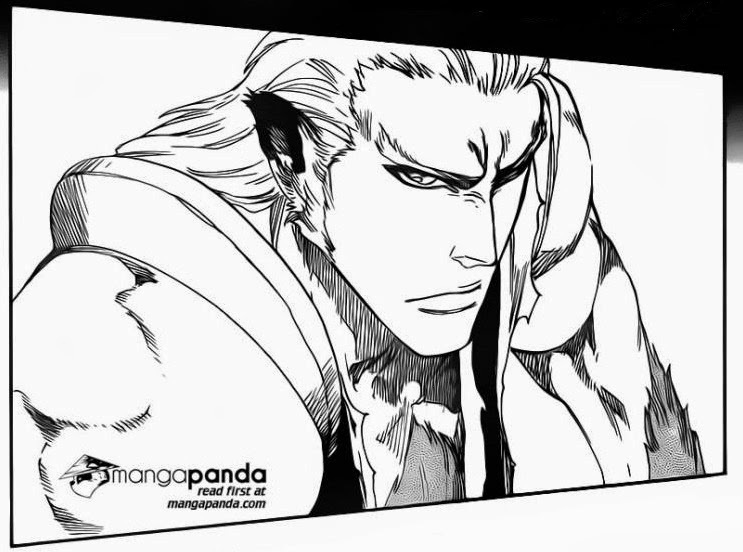 "Komamura wants to learn the move 'New Bankai', but Komamura cannot learn more than four moves. Would you like to delete a move to make room for 'New Bankai'?" Good Things: The fight with Bambietta is getting more serious. We’ve avoided a long flashback with Komamura and his great-grandfather. Bad Things: Momo’s appearance seems fairly useless. Uncertainty regarding Komamura’s new form. ClayDragon is currently studying Physics at university, and is constantly bewildered by it. The main method of contacting him is his Gmail account at kyleroulston1993@gmail.com. The alternative is his Skype account at kyleroulston1993. When not playing games or reading, he can be found with his head in his hands whilst trying in vain to understand quantum physics. He often wonders how cranes are erected. he isnt entirely human, his arms are still furry and his ears are still dog ears. His clan orignally looked like that, but when they died and had to atone for their sins, they became full dogs - since they had to pass through the beast realm. I like his new form, it displays the uniqueness about him because of the wolfish features. Yeah, I realised earlier that I misunderstood the origin of Komamura's 'origin', for want of a better word. I think I like his form, so I hope it's done well. When Generic-Girl-Quincy said that he had the "Explode" power, I thought her letter was "X". Who was it that had the "X"? What would that power be? Xylophone? X-Ray? Xcution?...Oh no. Komamura is a werewolf from the werewolf clan thing? I wonder how Ichigo is going to be part werewolf. The reasoning behind having werewolves is very interesting. So because their family did bad things, the werewolves were sent to the animal realm...and then came to Soul Society. World-Building fail. The "Animal Realm"? So that's where animals go? Why weren't his family sent to Hell? Does Hell even exist anymore? And Komamura is a human after all? Well that ruins any character development involving coping with accepting who you are. If there is a Quincy with the letter 'X', maybe it'll stand for Xtinction? Actually, this isn't really a world-building fail. It refers to Buddhism - specifically, the idea that people can be reincarnated and sorted into different categories that exist in separate 'realms'. There's the Human realm (i.e.the real world), the Preta realm (the Bleach equivalent to which is the Soul Society), the Naraka realm (i.e. Hell) and the Animal realm (which is where Komamura's clan were sent when they were reincarnated). There's one (or two, depending on who you speak to) more realms, but since they don't have a direct representation in Bleach I won't go into them. Presumably, Komamura's clan were bad enough to avoid going to the Soul Society, but still good enough to avoid going to Hell, so the only other option for them was the Animal realm. I assume Hell still exists, but I think it isn't mentioned due to the fact that there hasn't been anyone yet who's evil enough to send to Hell when they die. Komamura is still a wolf-man, he's just temporarily gained a more powerful form. He'll most likely go back to being his old self after this battle. And he accepted who he was after his fight with Kaname, I think. Maybe the last 2 realms don't have a parallel in Bleach because that wasn't what Kubo had in mind. He probably made it up on the spot. So Shrieker, who killed people as a human, is sent to hell, but if Tsukishima plans to take over the Afterlife by manipulating people by making them his friends, that's okay. More stuff needs to happen, but it's probably going into "fight, fight, fight" mode. Okay, I heard about the actual translation of Bleach 556's actual translation over Manga-panda's crap translation. It's is based on the Buddhist Beast Realm.. Apparently the Werewolves were a clan living in Soul Society. Don't ask me how werewolves live in the afterlife, and don't ask me how dead Death Gods (Shinigami) live, have children and die in the afterlife either. Then because the Werewolf Clan is evils and all that jazz, the Shinigami couldn't send them to hell, but sent them to the "Beast Realm". Of course, because the Shinigami are absolutely terrible at their jobs, Komamura's clan could "return." So the clan could remove their chains of sin and return to their original Werewolf form, which is a human with furry ears and etc. You know, as opposed to a fox standing on two legs. Of course, because the Shinigami are terrible at their jobs, the punishment chain can be removed. The Japanese clears stuff up slightly, but nothing can completely clear up Tite "I can make up my 'masterpiece' up as I go along" Kubo.